As far as mechanical skills go, I am the kind of person who can be reciting the “lefty loosey, righty tighty” mantra under my breath while still turning the screw backwards. I am so bad at working with tools that if I really want Stormy to fix something at the house all I have to do is sweetly suggest that I can do it myself with his tools and he will have the repair done before I can make it to the toolbox. So imagine Stormy’s surprise when I mentioned that I had always wanted to take the Fabric Covering 101 class at Oshkosh. I am sure he thought I would be out of there in under 15 minutes, but I figured since I fly a fabric plane it might be nice to understand how it got covered. Now I haven’t gone crazy; I don’t actually want to learn to rebuild an engine or anything but I figured fabric would be about my speed. Taking flight is still very magical to me and I would hate to spoil that with too much technical info (most of which I will forget as soon as I hear it)! Right off, I liked the classroom instructor because he repeated Stormy’s favorite advice over and over which is: You can try to skimp on airplane repairs (in this case covering) and you might save some money (initially) but if the shoddy work doesn’t kill you, it will probably cost you a lot when you try to sell your plane (if you haven’t made you plane worthless by failing to adhere to the FAA regulations). I liked this guy and I sure wished that Stormy had been there to hear him. 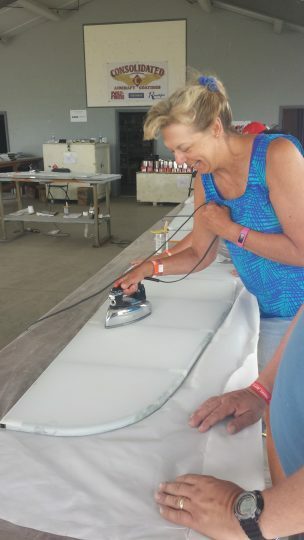 The instructor explained the different types of fabric aircraft covering and I learned the pros and cons of the Polyfiber process used to cover my little plane. The thing I was most excited to learn is that this process “does not support combustion.” I don’t know about you, but I am all about not supporting combustion in my plane whether on the ground or in the air!